Terms & conditions | LiCCo. 1. All intellectual property rights in the information, on the LiCCo website (the Site) are vested in the partners of the Project and, subject to paragraph 5 below, all rights are reserved. 2. 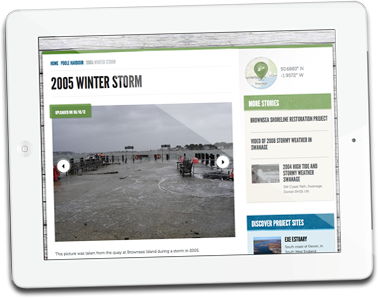 The project has been developed to help coastal communities to better understand, prepare for and adapt to the impacts of climate change, sea level rise and erosion on the natural and human environment. The Site is designed to spread awareness of the activities and research of the Project to allow users to understand and follow progress in the Project. Users must accept therefore that the Site has no legal status nor does it represent definitive technical knowledge. It should not be relied upon in any legal proceedings or in respect of any decision making without further investigation. 3. The Site has not been prepared to meet your or anyone else’s individual requirements and so it is your responsibility to ensure that any information you use from the Site meet your needs. 4. We accordingly give no promise that the Site will always be up to date and disclaim any responsibility or liability whatsoever for errors and omissions in the Site. We cannot guarantee that the site is free of any defects and you should do the appropriate virus checks. 1. The LiCCo project website contains hypertext links, giving access to websites that are not published by the LiCCo project’s partners. Consequently, they shall not be liable for the content of the websites to which the visitor could have access via these links. Please make all links obvious so that anyone reaching our site through your link realises that they have reached our site. Please do not make our pages appear in frames from your site. Please do not allow advertising on any page in which a link to our site appears. The copying and use of the Project Partner logos and the LiCCo logo is not permitted without prior approval. Permission requests should be directed to the relevant body. Tell us who you are, the organisation you represent (if any), how and why you wish to use our logo. Please include your contact details: name, address, telephone number, fax number and e-mail. In compliance with the French data protection Act of 6 January 1978 (amended by Act of 6 August 2004), we will not collect personal data without the knowledge and consent of the user of this website. LiCCo Project, Manley House, Kestrel Way, Exeter EX2 7LQ, England. Finally, no personal information will be communicated to third parties.